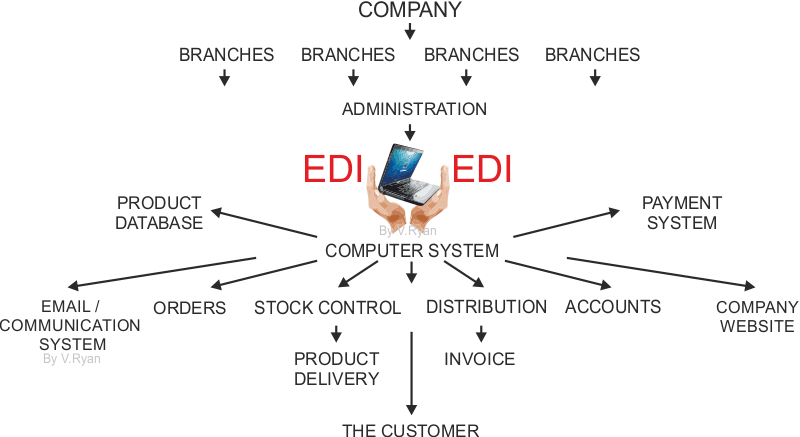 Companies that use e-commerce often use Electronic Data Interchange (EDI). EDI involves using standardised document / file formats across the entire company. This means that employees use the same system to order materials, track customer orders, control stock levels, produce invoices and to carry out accounting. A very good example of a standardised document format is PDF. This type of document can be emailed and opened on most computer systems, including smart phones. Reduces the overall costs of running a business, as the computer system carries out difficult and complicated tasks automatically. The computer system monitors and controls most aspects of the business. Stock levels, order levels, accounts and invoices are known immediately, without the need for labourious manual intervention and accounting. EDI eliminates the need for most paperwork, helping the environment. Improved communication between employees and branches, due to the use of standardised document and data formats. Systems need continual electronic protection, from viruses, hacking and potential fraud. EDI systems need regular software updates. In case of a systems failure, manual systems must also be in place to ensure that business continues. Staff must recieve training, every time the EDI system is updated. This is a continuous investment. Companies relying on EDI must invest in backup systems, in case the primary system fails. Human input error is still potentially a problem, although the software being used should highlight most errors. Data Protection Laws, protecting customers and employees, must be applied and adhered to by employees and the company.